One Dance UK hosted shortlisted nominees, sponsors, supporters and leading lights from the dance sector last night for a sparkling awards ceremony at The Great Hall at Leeds Beckett university. 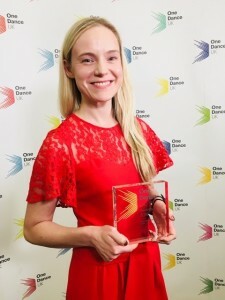 Karolin Krell, Osteopath and Physiotherapist, won the Dance Healthcare Practitioner award. Karolin Krell trained as a Physiotherapist in Germany at the renowned Asklepios Scoliosis Clinics Katharina Schroth (International Academy Asklepios Clinics). Karolin also studied at the British School of Osteopathy in London, the largest and oldest school in the UK for four years to graduate with a Master’s degree in Osteopathy. Additionally to being a Physiotherapist and Osteopath she further specialised with a postgraduate Master’s degree in Performing Arts Medicine from University College London (UCL). Karolin’s main passion is for dance and acrobatics within the Performing Arts, she supported various circus and dance theatre companies backstage during very busy touring seasons in the UK. It was an evening of celebration and a unique moment where the entire sector could come together and applaud the talented professionals and practitioners working in dance today.